Winston Churchill thought he was a military genius; others considered him greatly overrated; a few even thought him mad. Almost sixty years after his death at age forty-four in an airplane crash, Orde Wingate remains perhaps the most controversial of all World War 11 commanders. Born into a fundamentalist Christian sect and raised in the Cromwellian tradition of Sword and Bible, Wingate was an odd mixture of religious mystic and idealist, combining an unshakeable belief in an Old Testament God with an insatiable interest in music, literature, history, philosophy and the politics of his day. But his overriding and enduring passion was for Zionism, a cause that - although neither he nor his wife had Jewish blood - he embraced when posted to British ruled Palestine in 1936. There he raised the Special Night Squads, an irregular force that decimated Arab rebel bands and taught a future generation of Israeli generals how to fight. 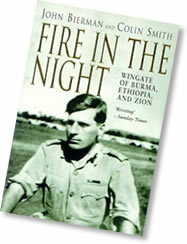 In 1941, Wingate led another guerrilla style force, this time into Italian occupied Ethiopia, where he was instrumental in restoring Emperor Haile Selassie to his throne. But the campaign that was to bring him world fame was conducted behind enemy lines in Burma, where his Chindits shattered the myth of Japanese invincibility in jungle fighting, giving Allied morale a much needed boost at a crucial point in World War II. Throughout his career, Wingates unconventionality and disdain for the superiors he dismissed as military apes marked him as a difficult if not impossible subordinate. He was that, but also, as this vigorous new study reveals, an inspiring leader. Since a boy I have been fascinated by Orde Wingate, the eccentric general who eschewed parade ground swagger and needless bull and led from the front when he took his famous Chindits, for the most part ordinary British infantry, on arduous treks behind Japanese lines in Burma. But in Britain Wingates posthumous reputation waxed and waned. Churchill, with his enormous appetite for men of action may have thought he was a genius but this was not a view shared by all, possibly most, of the British military establishment. It was not until 1990, almost fifty years after his death, that the Duke of Edinburgh unveiled a memorial to the Chindits and Wingate on the Thames Victoria embankment. In Israel there has never been any of this equivocation. Every year since the early 1950s its ambassador to the United States has laid a wreath on Wingates grave at Arlington cemetery where he lies with the jumbled remains of the American air crew and three British war correspondents who died with him. Wingate streets and squares abound. Most of Israels major sporting events take place at the Wingate Institute on the coast road just north of Tel Aviv, the country's national sport and physical training centre and never mind that Wingate, the intrepid horsemen, disliked all team and ball games. Alongside the Institute is the Israeli Armys Camp Hayedid which in Hebrew means The Friend and was the code name given to him by the Haganah, the Zionists' underground army in British Mandate Palestine. In the event the Israeli government did not acquire the papers. Those relating to Wingates Burma and Abyssinian campaigns went to the Imperial War Museum in London. The pre-war Palestine documents were bought by the Steve Forbes Foundation in New York but microfilmed by the British Library before they were allowed to leave the country. Meanwhile, I had been commissioned by The Sunday Times to write a long piece about Wingates Israeli connections and interviewed several people who had known or served under him when he recruited Jews into his Special Night Squads. Among them was Abraham Akavia from Haifa who had not only interpreted for Wingate in Mandate Palestine but, far more interesting, had been alongside him throughout the Ethiopian campaign as kind of unofficial adjutant. My appetite to learn more about Wingate was now whetted and it was at this point that I got together with the former BBC reporter and author THE LATE John Bierman an old friend and colleague from various conflicts who, like myself, was living in Cyprus. Johns books include two highly commended biographies: one on the journalist and explorer Henry Morton Stanley and the other on the aristocratic Swede Raoul Wallenberg who rescued thousands of Hungarys Jews from the Nazis only to vanish into Stalins nightmare nether world. John had made a successful documentary film about Wallenberg and we attempted to do the same with Wingate starting in Cyprus where we had discovered Colonel Tony Simonds, who had been close to Wingate in both Palestine and Ethiopia, was also part of the islands large British community. But when we could not get sufficient funding for a film, we did what we had been edging towards for some time and decided to write a book, though not without some trepidation for neither of us had ever written in tandem before. To, I think, our mutual surprise we found it far less painful than we thought it might be. As a glance at the attached reviews shows, Fire in the Night, first published by Random House in New York, was well received on both sides of the Atlantic though we were disappointed that, despite initial Hollywood interest, a feature film on Wingates life came to nothing. I have not given up hope.